Chaos and high elves introduced in this game expansion. It's also possible to play Rough-and-Tumble with the only expansion, the two editions can be used separately from one another. It's not a normal board game that you buy and put on a shelf, this is a game for your 3D printer! By buying this, you will receive files to print miniatures, map and markers, directly by your own 3D printers, while cozy at home! -if you already own a 3D printer, it's cheap and also funny, you will print unique and incredible quality models. -If you don't own a 3D printer, it can be an opportunity to buy one! Costs for a printer are already low and accessible to anyone. You can still use a service like: 3D hub, shapeways, or any other that the net are crowding. -No shipping cost! Anywhere in the universe, you just download the files and print! -You can print it as many times as you want, for you and your friends. 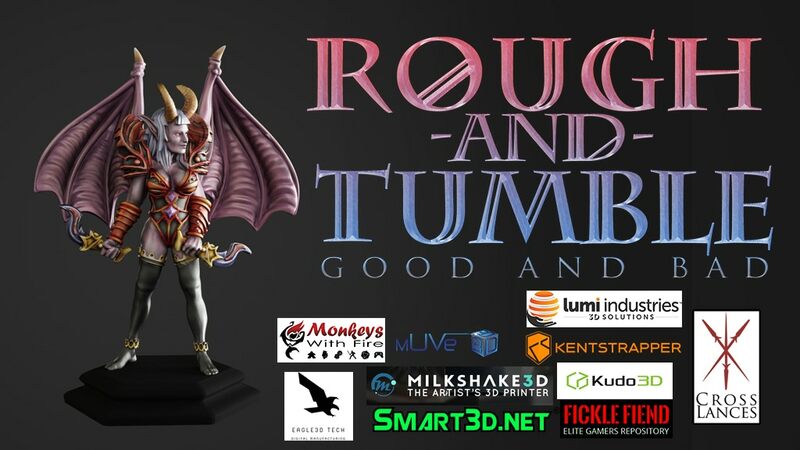 -You can decide any printing dimension, from miniatures to real size titan sculptures! - You can use these miniature for other games, as proxyes in games like ninth age or fantasy football. for a correct miniature print in 28mm scale, it's suggested a good quality printer, with at least 100micron resolution, so that all the details of the miniature are visible and the high quality of the sculptures is adequately exalted. Don't be afraid if your printers have lower specs, you can still print them giving up to some details, or print in a bigger scale, getting over the printer problem. The campaign's more than 10x funded with still 27 days left to go.